Today Home Care Assistance, the leading provider of in-home care for seniors, released a study they commissioned through Research Now illuminating the emotional impact of dementia caregiving in the United States. With one in four adults serving as a caregiver for an aging loved one and with Alzheimer’s and other forms of dementia surging among our rapidly aging population, the unrelenting stress and emotional toll of witnessing the “long goodbye” stands to pose a health care challenge of its own. With roughly 5.5 million Americans living with dementia, the illness actually costs more to care for ($259 billion) than cancer ($77 billion) and heart disease ($102 billion) combined. Behind these numbers lies a hidden, but very real, emotional cost to family caregivers who help those with Alzheimer’s and other dementias manage daily living. Dementia caregivers experience higher rates of physical, emotional and mental burnout. Often referred to as “caregiver burnout”, the survey found that dementia caregivers were seven times more likely to experience daily physical, emotional and mental exhaustion from caregiving than non-dementia caregivers. The survey also found that dementia caregivers were three times more likely to feel extreme stress from their caregiving responsibilities than other types of caregivers. Dementia caregivers feel the most stress from watching their loved one decline, while other caregivers are most stressed from juggling work and care responsibilities. In contrast to other types of care that may have a focus on recovery and rehabilitation, caring for someone with dementia can oftentimes be more challenging since the person is facing a long, inevitable decline. Based on the survey results, 38 percent of those caring for a loved one with dementia feel the most stress from watching their loved one decline, while 33 percent of those caring for a loved one without dementia feel the most stress from having to juggle their job and caregiving responsibilities. When looking at gender breakdowns of stress, the survey showed that male dementia caregivers were 21 percent more likely to feel stressed from having to juggle their job and caregiving responsibilities than female dementia caregivers. When it comes to managing child and senior care, female dementia caregivers experience higher rates of caregiver guilt. According to Home Care Assistance’s survey, female dementia caregivers were twice as likely to feel extreme guilt for not tending to their own family and children’s needs than male dementia caregivers. More so, there were some significant discrepancies seen between females that were caring for a loved one with dementia and females that were caring for a loved one with another disease. Female dementia caregivers were 61 percent more likely to feel extreme guilt for not tending to their own family and children’s needs than non-dementia female caregivers. In acknowledgment of the heightened stresses of dementia caregiving, Home Care Assistance will be awarding respite care grants to 60 family caregivers. The program was launched in conjunction with its partnership with Maria Shriver’s Women’s Alzheimer’s Movement and Move for Minds, and is open to caregivers across the country. To learn more or apply for a respite care grant, please visit: http://homecareassistance.com/moveforminds. 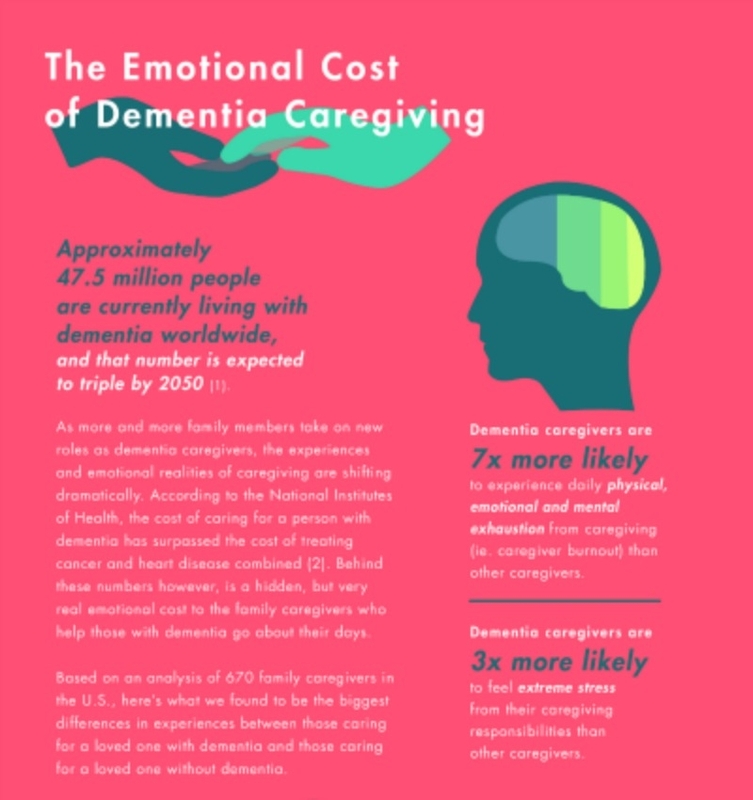 To view the complete findings around the emotional cost of dementia caregiving, download the full report here: http://homecareassistance.com/emotional-costs-of-dementia-caregiving. This survey was conducted online within the United States by Research Now on behalf of Home Care Assistance from May 8th-11th, 2017 among 670 family caregivers aged 18 and older. This online survey is not based on a probability sample and therefore no estimate of theoretical sampling error can be calculated. For complete survey methodology, including weighted variables, please contact Grace Zavolock at gzavolock@homecareassistance.com. Home Care Assistance is the leading provider of in-home care for seniors serving the United States, Canada, and Australia. It’s uniquely integrated, science-based approach to aging directly supports individual lifestyles and quality longevity, enabling seniors to live happier, healthier lives at home. Named an Inc. 5000 company eight years in a row and one of the 50 fastest growing women-owned companies worldwide in 2017, Home Care Assistance has been recognized as a 2017 Endorsed National Provider by the home care industry’s leading research firm, Home Care Pulse. Home Care Assistance CEO Lily Sarafan was also named Health Care Executives’ 2016 Woman of the Year. For more information about Home Care Assistance, please visit www.homecareassistance.com. My friend’s mom is starting to show signs of dementia. What they do is as much as possible, they make sure she or her sister helps around with their dad in taking care of their mom. The parents even moved house closer to their daughter’s. I admire their full family support. For sure, caregivers take on the burden and struggles with giving care to the patient. I think if more people are involved with giving the care, there’s less chance of severe stress for one caregiver. Caregivers must care for themselves as much as they do for their loved ones! The data here is helpful and enlightening on several levels. Respite certainly reduces burn out. Yes they could have get sick in the future but you can alter that by just taking it calmly.